Ever seen a hippopotamus swimming in the rivers of East Devon? Seems unbelievable but once it was true! The Honiton hippo is now quite famous. It is hard to believe that the little town of Honiton with its many shops, houses and highways was once marshland. About 100,000 years ago the area was home to elephant, hippo, bison, cave lions and red deer. RAMM has recently done some work on this party of the collection. We are keen to hear from researchers who might be interested in taking this further. In 1965 a new road was built near Honiton. 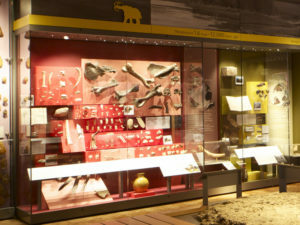 The work revealed a rock section rich in mammal bones. Some reports say the excavated bone remains come from 17 different individual hippopotamus but others suggest just 3. They also found straight-tusked elephant, giant ox and red deer bones. Unusually, the hippo bones either belong to juvenile or elderly individuals. Suggestions are that the hippopotamus lived in a rather marshy and boggy area where occasionally weaker animals such as the very young or old became trapped. 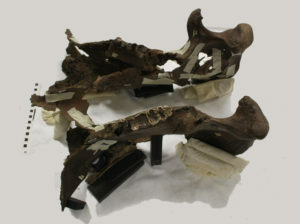 In 1968 the Ministry of Transport donated these fossil bones to RAMM. Specimens can be browsed on Collections Explorer. A conservation student has spent many hours carefully studying RAMM’s collection. Many of the specimens are just fragments of bone. Yet she has managed to piece many of them back together and formed part of a hippo’s lower jaw. The Quarternary started around 1.6 million years ago. People often describe this as the ‘Ice Age’ because of the snow, ice and glaciers. Even North Devon was temporarily covered by an ice sheet. The annual average temperature was 7-10ºC below today’s values. However, several warmer periods interrupted the cold. These are called an ‘interglacials’. Glaciers melted, big rivers developed, and sea levels rose. Average temperatures were higher than today and winters were much less severe. During the interglacial phases animals migrated from Southern Europe towards England. They found a perfect habitat rich in food and water to live in . About 100,000 years ago, during one of these warmer periods called the Ipswichian, a wide range of species lived in South Devon. The water-rich and boggy area around Honiton was particularly attractive to hippos. Come and see RAMM’s hippo in the Down to Earth gallery!